Queensland author Nike Sulway is a versatile writer. She won the Queensland Premier’s Literary Award for an Emerging Author and was also shortlisted in the Commonwealth Writers Prize with her novel The Bone Flute, (UQP, 2001) and also published The True Green of Hope (UQP) in 2005, both under the name N.A. Bourke. I knew her work as a children’s author when, under the name Nike Bourke, she and illustrator Stella Danalis were shortlisted in the 2006 Children’s Book Council of Australia Awards and I read her picture book, What the Sky Knows to my classes. I can see from her Goodreads page that she also writes science fiction and fantasy, and that under the name Nike Sulway, she won the James Tiptree, Jr Award for Rupetta, (Tartarus Press, 2013) for a work that explores and expands our understanding of gender. Samuel and Morgan are twin brothers, separated by more than the oceans that lie between them. Samuel, whose point-of-view dominates the narrative, has stayed at home in Australia, caring for his widowed mother and living a conventional if lonely life. Morgan took off after his father’s suicide and has never returned. His sole contact with his family is to forward his writing for translation by Samuel. As boys, they had created a fantasy land with its own history and language, and now the continuing Nahum stories are widely read, providing both men with work to do and an income to live on. But Morgan’s extreme political beliefs have led him to live a nomadic life, and to eschew both possessions and relationships. His brother Samuel actually knows almost nothing about him. The story begins with Morgan’s unexpected death in the Netherlands, and the arrival of his enigmatic partner Ana, who accompanies the body home. She also brings the last Nahum manuscript, and the prospect of Samuel learning something about his brother’s life. But silences descend. There are silences like thefts. A word stolen from the mouth before it is spoken. Deep in the cave of the body, past the glottis and the epiglottis, sinking further, down past the larynx. It waits for the dark opening and plunges deep into the chest, the lungs, burrowing in, taking root in that silk-wet darkness. A black seed, wintering in the body. In a wholly unexpected twist, events conspire to make Ana break these silences, revealing complex desires. As it happens, I’m reading Ben Okri’s The Famished Road which – while entirely different in every way imaginable – also features a character determined to make a family allegiance true. 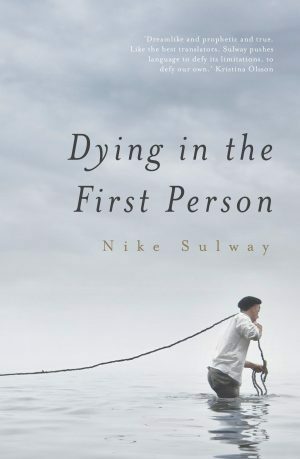 Dying in the First Person is a beautiful book which would, I am sure, be rewarding for book groups which enjoy quiet books that linger long after the last page is turned. You can find out more about Nike Sulway at Perilous Adventures. Review copy courtesy of Transit Lounge. Yes, very clever, and the more so when you read the book! The title alone is irresistible, but I am intrigued by some of the themes the book explores. It is available here as an e-book, so I’ve added to my long wishlist. Sounds fascinating. I guess we all know the silences of the phone that does not ring or the letter that does not arrive (I’ve probably caused a few as well) but the silence of a language no longer spoken seems the saddest. I’ve been looking at Aboriginal history in Miles Franklin country and so little is known. Transit Lounge is one of my favourite publishers: they have really interesting books that are diverse without being heavy-handed about it because it just comes naturally to them and their authors. I’m always fascinated by authors who write (successfully) across vastly different genres – this, science fiction and children’s books? Impressive. Agree, because with children’s books you’re writing for multiple audiences (children, adults and the visual) plus you need meaning AND simplicity. Hard! And you have to have something meaningful to say. Kids don’t have patience with books that don’t make them think. Yes, they’re the most demanding and honest of audiences!